To conversations shared, stories told and ideas hatched. Here’s to you. Since April 1971, Starbucks has been changing the world’s relationship with coffee. We helped people everywhere say goodbye to a bland, watery cuppa joe and hello to a darker, richer, everyday taste experience. We resurrected the art of pulling the perfect shot. We even invented a new (as in triple-Venti-nonfat-extra-foam-latté) language. And we couldn’t have done it without you. 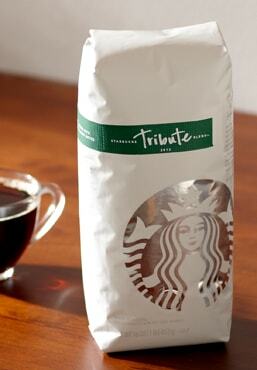 That’s why we’re celebrating 40 wonderful years with something for you—Tribute Blend. Tribute Blend features four of our highest quality beans—Aged Sumatra, Papua New Guinea, Sun-Dried Ethiopia, Colombia—all blended together to honor the most important part of our business: you!